Single Sail Software is pleased to announce that Big Red Clock is now available on the Apple TV app store app! 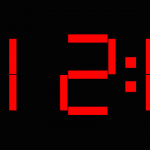 Big Red Clock turns your TV into a gigantic digital clock. …and red is just the beginning with many other classic display colors to choose from. FREE now for a limited time. Visit the app store on your the new fourth generation Apple TV and search for “Big Red Clock”.